Shootings targeting police in Dallas and Baton Rouge this month have pushed the number of police officers shot and killed nationally in the first seven months of the year to more than 50 percent higher than what it was at this time in 2015, raising concerns for officers' safety in a time of heightened tensions between law enforcement and those outraged over police brutality. Following the death of three Baton Rouge officers gunned down in Louisiana's capital early Sunday, 31 police officers have been killed in the line of duty in firearms-related deaths this year, according to data from two non-profit organizations aimed at honoring fallen law enforcement officers in the United States. Three Baton Rouge police officers were shot and killed Sunday when responding to a report of shots fired, the East Baton Rouge Sheriff's Office reported. The incident comes a week after four people were arrested for allegedly plotting to kill Louisiana law enforcement officers and nearly two weeks after the death of Alton Sterling by police sparked protests over officer-involved in the city. The officers' deaths takes the national tally of police officers killed in the line of duty by gunfire to 31, a significant increase from the 18 officers shot and killed at this time last year, preliminary data released by the National Law Enforcement Officers Memorial Fund shows. Prior to the attack on police Sunday in Baton Rouge, 63 law enforcement officers have been killed overall so far this year in the line of duty, according to data from the Officer Down Memorial Page. It's worth noting, however, that there's a slight discrepancy in the data reported by the Officer Down Memorial Page and the National Law Enforcement Officers Memorial Fund, which claims 60 officers have been killed from January to mid-July. While firearms-related incidents have so far claimed the lives of more officers this year than any other cause of death, vehicular-related incidents are a close second, having killed at least 24 law enforcement members in the first seven months of 2016. 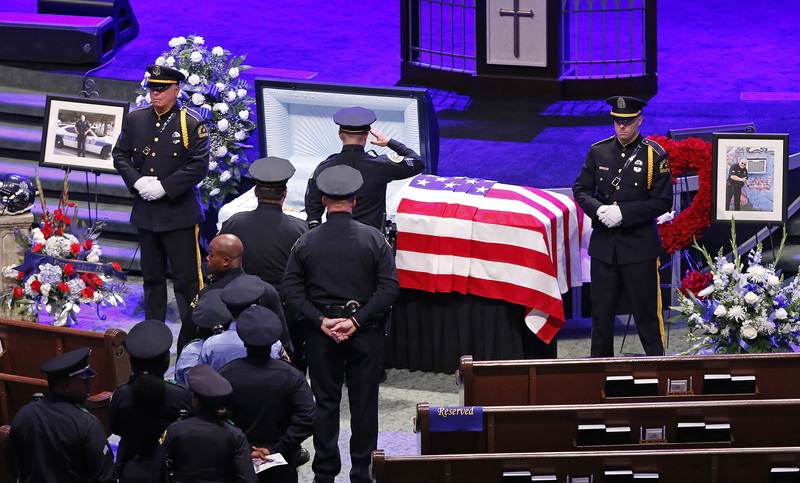 The deadliest day for law enforcement this year — as well as since the September 11 attacks — occurred July 7 when five officers were shot and killed in an attack targeting police during a peaceful protest against officer-involved shootings held in downtown Dallas. The attack put law enforcement officers nationwide on guard and pushed some to go as far as alleging a "war on cops" had begun. But while the number of police officers shot and killed on duty this has significantly increased when compared to the year before, it pales in comparison to the 522 people reportedly killed by police in 2016.